Fairground Bingo Review | £25 FREE + 7 Days FREE Bingo! Fairground Bingo is a new bingo site that operates on the Cassava Enterprises label. 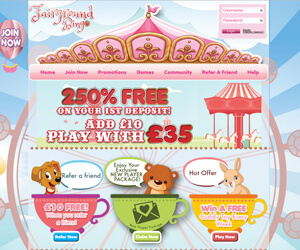 The site has a gorgeous fairground theme with bright colours, cute stuffed animal graphics and a lovely layout. All of this combined with the fabulous games, promotions and community make Fairground Bingo one of the top new Cassava bingo sites to debut in 2015. When new players sign up at Fairground Bingo they are treated to an immediate 250% bonus on their first deposit and 7 full days of FREE bingo in the Newbie Room. Additionally, new players have a chance to win a FREE cuddly toy just like at a real fairground! As well as this, new players get £22 to play with and a FREE entry to win two passes to a Theme Park after making their second £10 deposit. The winner of the tickets will be able to choose from ten different theme parks all of the UK. There's also a chance you could win a share of £250 in another prize draw after making your third deposit of £10. Besides the new player package, another top promo is The Big £10,000 where you can win a guaranteed share of £10,000. Fairground Bingo caters to players with a fine selection of the best online bingo games. They have fabulous collection of 90-ball bingo games and 75-ball bingo games as well as a special version of bingo called High 5 Bingo. There are also tons of different coverall jackpot games with guaranteed jackpots as high as £1500 that play on a daily basis. There's also an incredible variety of side games at Fairground Bingo with plenty of top titles to choose from. Some of the best instant games available on this site include Wizard of Oz, Starburst Slots, Jack and the Beanstalk, Gonzo's Quest and the ever-popular Fluffy Favourites.